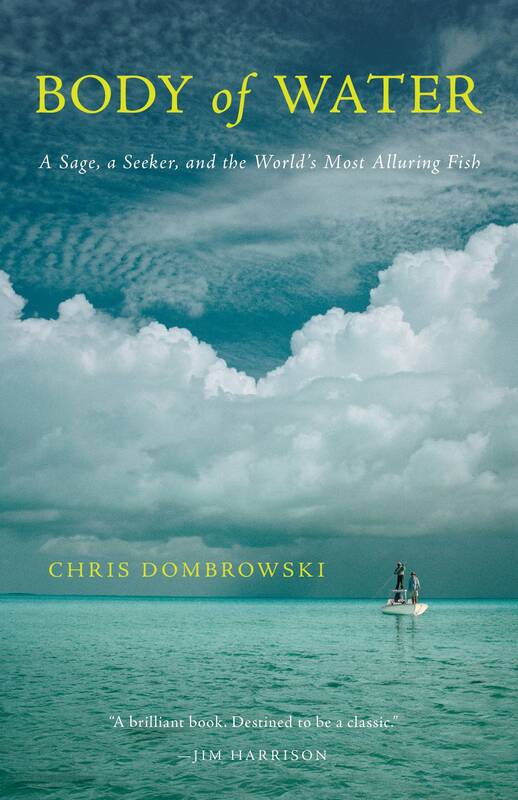 Listen Chris Dombrowski on "Body of Water"
When Chris Dombrowski left for a fishing trip in the Bahamas, he thought the fish would be the highlight of the experience. But when he met David Pinder, an experienced bonefishing guide, a window into another worldview opened up. Dombrowski, a Montana fly-fishing guide and a poet, joined MPR News executive editor Mike Edgerly to talk about his trip and the book it inspired, "Body of Water." Below is an excerpt from the book. Author Jim Harrison, legendary for his own writing on the outdoors and the natural world, hailed "Body of Water" as a "brilliant book." To listen to the interview with Chris Dombrowski on "Body of Water," use the audio player above. An excerpt from "Body of Water"
It took a while to carve in past the small talk, but eventually David sorted through my scattershot questions and pointed north toward where he had grown up in a two-room house, bunking on the floor with his brothers, his sisters sharing a mattress in the next room, twelve kids all told and the slumber — what with all the arms and legs scratching bedbug bites — far from sound. "Nights when I couldn't sleep," David said, his deep voice harmonizing momentarily with the guttural groan of the passing ferry's engine, "I would ask my father how we got here, so far from where he was born, on Eleuthera." David breathed deep and looked up at the trees around the yard, the palms' fronds high-noon still. A good fishing morning, he offered, an aside not lost on my nerves. Like many Bahamians of West African descent, David's father Samuel had been born a free man and roved the archipelago via sponging boat before landing at East End. "Not much for stories, but he would tell it: 'You stop somewhere sponging and squat. Fall in love with a woman, squat.' He'd roust us in the dark with chores. 'Take the small boat up to Big Sound and walk the mud flats for shinies. A man coming to town soon will buy them.' Five dollars for a quart. Seven thousand to fill a jar. If we got home before he did we should dye and trim sponges, press the cured ones into bales. Tough work but it beat sailing all day to Red Shank, oaring if the wind's not right." One otherwise uneventful Thursday morning, Samuel Pinder, pastor of the McLean's Town church, would suffer a sudden stroke and die three days later on the Sabbath. Not long after his father's funeral, David found himself teaching at the McLean's Town school — yet another visiting instructor had come, surveyed, taught for a few weeks, and, scrimshanking, left for parts unknown. Thus the school's finest student was tasked with giving rudimentary lessons until the next import arrived. One of his peers reminded him fondly of his mother. Her name was Nicey (knee-sea) and for a whole week in October she stayed home sick. Each day he fretted, and on Friday, instead of sending Nicey's homework with her sister, David sent a letter. A few months later sixteen-year-olds Nicey and David were married, the minister listing their ages in the official registry as eighteen, in adherence with Crown law. "It was," he said, looking across the water at a horizon line obscured by humidity, "the year I got in love. "I probably would have stayed a sponger's son. Who knows where I would have ended up? The wind would blow you one way one day, another way the next. We would hop from island to island on those sponging boats, but you couldn't make much money if you were black," he said, explaining that eight hundred sponges gathered by a black family would garner the same pay as five hundred sponges gathered by whites. "After a time all the sponge died. I think the Lord killed it off because it was being abused. Because we were being treated unfairly." About the time the sponge rebounded, David, nineteen, was working on a hard-labor crew at a US missile-tracking site near Freetown. One mid-April evening a wealthy man from Palm Beach arrived in search of a hand. An avid saltwater angler, Gil Drake had recently leased from the Crown a square-mile island across the channel from McLean's Town. Since purchasing land in the Bahamas in the late 1950s required royal connections, Drake's wife, who was of extremely high-test Philadelphia money to bankroll the purchase, called upon family friends Sir Henry and Lady Oaks, who shortly thereafter enlisted the queen. Since the island's moniker Crow Carrion wouldn't likely attract visitors and since Drake was ultimately hoping to build a fishing lodge on the north shore of the cay, he dubbed it Deep Water, and shortly thereafter, on the fourteenth day of April 1956, regarded a trio of young rock-lugging Bahamians, and approached the one who appeared the fittest of the three. Did young David Pinder know it was the anniversary of Abraham Lincoln's assassination and the sinking of the Titanic? Did he sense something ominous in the air? "I still count it as the luckiest day of my life," he said. We had made our way down his driveway to the water, where the tide was out. In the glaring distance a gull-chased fishing boat could be seen scribing a wide glare-cutting arc across the bay. "To have been chosen by Mr. Drake that day was a great privilege. I was barely earning four pounds a week at the missile site, small money. I was so happy he chose me over the other two. That was on Sunday. On Monday we were clearing mangroves so they could bring in a generator — he had hired two of my nephews as well — then later we put up a shed. This point, the Drakes lived on their boat, got their hands dirty just like us. We brought rocks in the dinghy across from McLean's Town, big chunks of rock and shoreline. Cracked them, mixed them into cement. Eventually Mr. Drake would hire a contractor from Palm Beach by the name of Charlie Counch who built the first cottage and lodge building. He shipped the materials down on a commercial fishing boat, but for now it was oaring over to camp loaded down with rock. The water almost over the gunwales." Having foraged on the newly named Deep Water Cay for as long as he could remember, David was intimate with the terrain around the island Gil Drake had procured. As a youth he had harvested lobster from traps in nearby East End Creek, handlined Cubera from the underwater swale to the south of the island. He knew which blue holes were chock-full of craws, and when the tides were right to dive for them. But most important to his new employer: David had encountered plenty of bonefish. From "Body of Water: A Sage, a Seeker, and the World's Most Alluring Fish" by Chris Dombrowski (Minneapolis: Milkweed Editions, 2016). Copyright 2016 by Chris Dombrowski. Reprinted with permission from Milkweed Editions.